Download "Journal homepage: tame.tw/forum.php?mod=forumdisplay&fid=56 Wang, Y. J., & Chen, K. H. (2016). Based on Cabri 3D and physical manipulatives to study t"
2 Journal homepage: tame.tw/forum.php?mod=forumdisplay&fid=56 Wang, Y. J., & Chen, K. H. (2016). Based on Cabri 3D and physical manipulatives to study the effect of learning on the spatial rotation concept for second graders. Taiwan Journal of Mathematics Education, 3(1), doi: /tjme Based on Cabri 3D and Physical Manipulatives to Study the Effect of Learning on the Spatial Rotation Concept for Second Graders Yu-Jie Wang 1 Kaung-Hsung Chen 2 1 Dayes Elementary School, Ta Yuan City 2 Department of Mathematics and Information Education, National Taipei University of Education For teaching spatial rotation concepts, this study investigated the learning effectiveness, problem-solving strategies, and error types produced by different teaching methods that used physical manipulatives with and without Cabri 3D geometry software. The study adopted a quasiexperimental, nonequivalent group design, and 61 second graders participated. The experimental group comprised 31 students who used physical manipulatives with Cabri 3D geometry software. The control group comprised 30 students who used only physical manipulatives without the software. The research revealed the following findings: Both the experimental and the control group exhibited considerable improvement following the posttest and showed that these methods of teaching spatial rotation concepts were effective for second graders; however, there was no significant difference in learning effectiveness between the groups. In addition, qualitative analysis was performed on interviews conducted after a relay test. 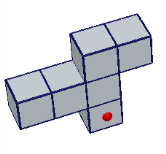 The results indicated the following problem-solving strategies and error types: Most students first used intuition to make spatial judgements, before finding overall similarities between objects, checking for possible alternatives, and confirming their spatial judgement by using mental rotation strategies that employed all or part of the objects. After using their intuition, some students directly chose without rotating the objects; these second graders were apt to make an error involving a mirror misconception. Finally, some suggestions for future research and teacher development are offered as a reference to researchers and teachers, respectively. 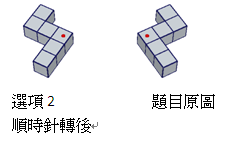 Keywords: Cabri 3D, spatial ability, spatial rotation concept Corresponding author:kaung-hsung Received:25 May 2015; Accepted:23 March 2016. 13 31 腦 教 室 於 Windows 作 業 系 統 下, 每 位 學 生 使 用 Cabri 3D 2.0 試 用 版 之 軟 體 的 操 作, 建 立 立 體 方 塊 快 速 堆 疊 旋 轉 的 影 像 輔 助 教 學, 從 不 同 視 角 觀 察 立 方 塊, 將 三 維 圖 像 辨 識 成 二 維 圖 像, 並 搭 配 實 體 積 木 教 具 操 作 使 用 以 對 照 檢 驗 旋 轉 後 的 結 果 產 生 內 蘊 由 於 實 驗 組 班 級 學 生 對 於 Cabri 3D 軟 體 操 作 不 熟 悉, 故 於 實 驗 教 學 前 先 實 際 到 電 腦 教 室 進 行 一 節 課 Cabri 3D 軟 體 基 本 操 作 的 教 學, 初 步 認 識 Cabri 3D, 使 用 滑 鼠 進 行 拖 曳 旋 轉 等 功 能 之 操 作 練 習 有 關 兩 組 教 案 活 動 舉 例 如 下 : 第 三 節 : 翻 轉 吧! 立 方 連 塊 教 學 活 動 舉 例 實 驗 組 1. 開 啟 檔 案, 如 圖 控 制 組 1. 教 師 佈 題 海 報 如 下 圖 1 於 黑 板 圖 1 (1) 請 學 生 將 在 學 習 單 第 2 題 上 的 立 方 塊 圖 1 (1) 請 學 生 將 在 學 習 單 第 2 題 上 的 立 方 塊 色 依 照 螢 幕 上 的 積 木 塗 上 顏 色 依 照 黑 板 上 的 積 木 塗 上 顏 (2) 請 學 生 塗 色 後, 再 以 滑 鼠 操 控 旋 轉 功 能 旋 轉 圖 1, 使 圖 1 與 學 習 單 的 立 方 塊 擺 放 的 角 度 相 同, 確 認 所 塗 的 顏 色 對 不 對? (3) 學 生 利 用 實 體 積 木 動 手 拼 出 如 學 習 單 第 2 題 之 立 方 連 塊, 並 旋 轉 實 體 積 木 與 旋 轉 螢 幕 虛 擬 方 塊 做 比 對 (4) 統 整 : 教 師 控 制 螢 幕, 旋 轉 積 木 呈 現 如 學 習 單 的 角 度, 學 生 再 次 確 認 螢 幕 畫 面 學 習 單 以 及 實 體 積 木 的 立 方 塊 是 否 相 同? (2) 學 生 塗 色 後, 請 學 生 以 實 體 積 木 拼 出 如 黑 板 海 報 上 的 立 方 連 塊 並 旋 轉 積 木, 確 認 所 塗 的 顏 色 對 不 對? (3) 請 學 生 發 表 要 如 何 旋 轉 此 積 木, 以 確 認 所 塗 顏 色 是 否 正 確? ( 學 生 上 台 示 範 旋 轉 大 型 積 木 ) (4) 統 整 : 教 師 旋 轉 大 型 積 木 呈 現 如 學 習 單 的 角 度, 學 生 再 次 確 認 黑 板 海 報 學 習 單 以 及 實 體 積 木 的 立 方 塊 是 否 相 同? 24 42 此 類 型 學 生 多 是 以 直 觀 方 式, 判 斷 立 方 塊 整 體 的 外 形, 尋 找 整 體 結 構 相 同 的 答 案 4. 選 擇 容 易 翻 轉 旋 轉 的 立 方 連 塊 學 生 認 為 有 兩 個 可 能 是 正 確 答 案 的 選 項 時, 會 傾 向 選 擇 在 翻 轉 上 是 較 簡 單 完 成 的 答 案 較 複 雜 的 翻 轉, 亦 即 旋 轉 角 度 比 較 多 時, 學 生 雖 有 猶 豫, 但 不 會 選 擇 該 選 項 SC31 回 答 第 10 題 :( 正 確 ) T: 第 10 題 你 怎 麼 做? SC31: 應 該 2 是 一 樣 的, 然 後. 因 為 它 ( 選 項 2, 圖 15(A)) 這 個 只 要 稍 微 轉 過 來 再 放 平 就 好 了 這 個 ( 選 項 1, 圖 15(B)) 也 是 一 樣 要 再 翻 還 要 再 轉 T: 那 如 果 把 它 翻 再 轉, 會 不 會 跟 第 10 題 上 面 這 個 圖 ( 圖 15(C)) 一 樣? SC31:( 點 頭 ) T: 也 是 一 樣? 那 2 也 一 樣 1 也 一 樣 你 是 覺 得 兩 個 答 案 都 對? SC31: 嗯 就 覺 得 一 個 比 較 好 用, 一 個 比 較 麻 煩 T: 喔, 所 以 你 選 了 一 個 比 較 好 用, 很 快 就 可 以 轉 好 的? SC31: 嗯 (A) (B) (C) 圖 15 SC31 於 試 題 10 的 解 題 記 錄 以 上 的 學 生 在 作 答 時, 當 認 為 出 現 兩 個 答 案 都 正 確 時, 會 選 擇 比 較 容 易 就 翻 轉 出 來 的 立 方 塊, 也 就 是 旋 轉 角 度 較 少 者 作 為 答 案 5. 轉 動 試 卷 學 生 會 選 擇 轉 動 題 目 試 卷 紙 張, 再 比 對 題 目 圖 形 來 選 擇 答 案 SC01 回 答 第 8 題 :( 正 確 ) SC01:2 號 ( 選 項 2) 也 有 可 能 在 這 裡, 這 兩 個 ( 選 項 2 和 3) 可 能 性 比 較 高 T: 哪 這 兩 個 怎 麼 選 擇, 哪 個 才 是 對 的? SC01: 那 我 們 就 來 我 們 就 來 反 轉 ( 翻 轉 ) 看 看 它 們 T: 所 以 你 要 轉 紙? 27 45 T: 那 第 2 個 答 案 對 不 對? SC17: 不 對 T: 為 什 麼? 你 有 沒 有 試 著 轉 或 翻? SC17:( 題 目 原 圖 ) 怎 麼 翻 都 跟 它 ( 選 項 2) 不 一 樣 如 果 把 它 倒 下 來, 這 個 會 頂 住 這 不 會 頂 住 T: 往 哪 邊 倒? SC17:( 手 勢 動 作 - 題 目 原 圖 往 後 倒 90 度 ) T: 所 以 你 的 意 思 是 題 目 往 後 倒, 會 有 2 顆 停 在 桌 上 ( 圖 18(A)), 但 是 選 項 2 有 4 顆 停 在 桌 上 ( 圖 18(B))? SC17: 對 圖 18 SC17 於 試 題 14 的 解 題 記 錄 (A) (B) 3. 與 桌 面 接 觸 的 數 量 相 同 時, 直 接 利 用 其 他 立 方 塊 的 特 徵 分 析 當 兩 個 立 方 塊 與 桌 面 的 關 與 桌 面 接 觸 的 數 量 相 同 時, 學 生 會 忽 略 可 以 再 進 行 旋 轉 對 照, 而 直 接 利 用 其 他 凸 出 桌 面 的 立 方 塊 特 徵 進 行 分 析 SE19 回 答 第 14 題 :( 此 題 學 生 選 了 正 確 答 案 2, 但 是 在 訪 談 過 程 中, 學 生 回 答 她 排 除 答 案 1 時 的 錯 誤 現 象 ) T: 再 來 看 14 題 SE19: 第 2 個 T: 為 什 麼 覺 得 是 第 2 個? SE19: 這 個 把 它 翻 正 翻 正 ( 手 勢 動 作 向 左 翻 ), 不 要 倒 下 來, 就 是 凸 凸 的 朝 下 面 T: 凸 凸 的 是 哪 一 塊? SE19:( 手 指 出 圈 起 處, 如 圖 19(A)) T: 那 老 師 編 的 1 號 是 題 目 的 哪 一 塊? SE19:( 手 指 出, 如 圖 19(B)) T:2 號 呢?